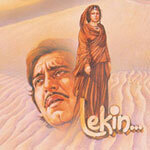 "Lekin" is a 1991 hindi film which has Vinod Khanna, Dimple Kapadia, Hema Malini, Alok Nath, Moon Moon Sen, Amjad Khan, Beena, Manohar Singh, Vijayendra Ghatge and Ajit Vachchani in lead roles. We have one song lyrics and one video song of Lekin. Hridaynath Mangeshkar has composed its music. Lata Mangeshkar has sung these songs while Gulzar has penned its lyrics.